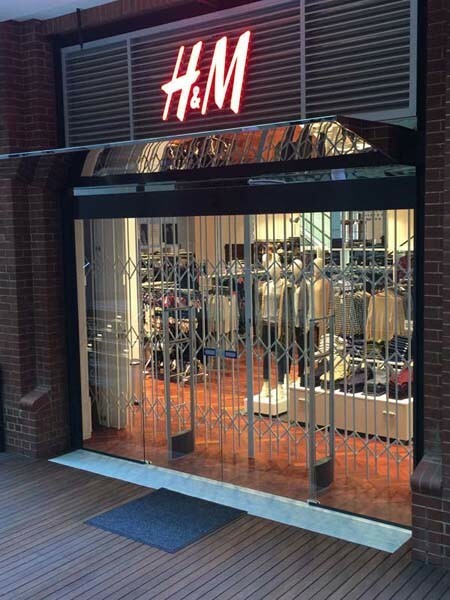 Premium grade high security scissor gates from The Australian Trellis Door Company (ATDC) were recently installed at the Perth store of well-known global retail brand, H&M in Perth. One of the world’s leading fashion companies, H&M has 161,000 employees across their 4400 stores in 65 countries. ATDC’s heavy duty steel scissor gates were installed as a security measure at the entrance to prevent break and entry into the high fashion store. Key features of the scissor gates in the H&M installation included high gloss white powder-coated finish; bi-parting gate retracting to both sides of the opening to form a neat compact stacking size at each end of approximately 15% of the overall span; open grille design allowing through-vision at night, maximising the display of the merchandise while providing security; virtually invisible during trading hours with the scissor gate occupying a very compact storage area; and 3600mm height requiring the use of heavy duty low friction industrial grade wheel carriages with metal bearings to allow the curtain to slide and operate effortlessly for functional integrity and longevity. Being top hung and weighing approximately 13kg/sqm, the installation required the heavy duty extruded top track of the scissor gate to be suspended directly below a continuous suspended steel beam running the entire span of the opening including the storage area to support the weight of the scissor gate. The Buchan Group was the specifying architect on the job while Valmont served as the project manager and builder. ATDC sells its scissor gates in Perth, Sydney, Brisbane, Melbourne and Adelaide, as well as all regional centres across Australia including Newcastle, Geelong and Townsville. ATDC’s scissor gates are exported to Singapore, Hong Kong, Vietnam, throughout South East Asia and the Asia Pacific as well as the Pacific Islands and the UAE.